To reduce particulate matter emissions from energy use in buildings by 50 % during the period 2015-2030. The challenge of the existing housing stock for the long term in Slovenia is to tackle the thermal efficiency of the housing stock, much of which is older and/or ‘harder to treat’. The IEE EPISCOPE project is intended to highlight where the initial potential for refurbishment exists and in which types of households. A key aim of the project is to evaluate more realistic refurbishment scenarios. The targets for emissions are intended across all sectors as a whole, rather than for housing in particular. In practice each sector may have more or less to contribute in terms of savings towards the total budgets into the future, however for modelling purposes in this project it is assumed that housing will aim to meet the targets as given. The Slovenian pilot project on local scale of EPISCOPE concers the housing stock of the Municipality Kočevje, which has set ambitious goals in its local energy concept [LEK 2008], [Covenant of Mayors 2014]. Its short-term goals for 2020 are a reduction of gas emissions by at least 30 % compared to the emissions in 2005 and an increase of the share of renewables up to 50 %. The main advantage of the city for exploitation of renewables is its local biomass district network. The municipal plan is continuous expansion of the network in order to increase the share of renewables with exploitations of local wood. The scenario approach uses a calculation model (developed in MO Excel and M Visual basic) with “three layers” for both national and local building stock. The first layer is a long-term model of the building stock. It quantifies the expected future annual in-use stock of dwellings (#) and reference floor area (m2) on the basis of the assumed past and future demand, i.e. the assumed development in persons, per-sons per dwelling and reference floor area per dwelling, potential for (partial/full/deep) renovation, based on the assumption for renovation and new build rates. This layer of the model also follows the ageing development of each type/age segment of the stock, with predicted lifetime of building component and it’s technologies for heating and DHW, after which the building becomes the potential for renovation. Based on the renovation rates for each age band, buildings in each year, the model identifies the buildings for renovation, respective to their age of construction, potential (based on a time from the last renovation) and type. The second layer of the model is an energy and emission layer. Here are pro-vided as model input data energy intensity values (deriving from typology) for different energy carriers, for each type/age segment of the stock and for each scenario. The last layer takes into account local or national plans, which can be implemented into a model on several different ways, e.g. more intensive renovation rates in specific year due to increased subsidies fund, increased share of grid connections due to network expansion in a city district. To be able to carry out a comprehensive analysis, all EPCs from the database were studied. In Slovenia, the EPC database collects data on the building stock, refurbishment measures, and the development of energy efficiency of buildings. Unrefurbished: Based on the existing data, the building was not subjected to any renovation in the past, therefore it has potential for renovation on all components of the thermal envelope (walls, roof, and windows). Unrefurbished buildings can be subjected to partial, full and LE renovation. Part_Renovation: Based on the existing data, the building was subjected to renovation of one building construction (walls, roof or windows) in the past, therefore the building has potential on two components of the thermal envelope (walls, roof or windows). Buildings with partial renovation can be subjected to partial or full renovation. Full_Renovation: Based on the existing data, the building was subjected to renovation of two building constructions (walls, roof or windows) in the past, therefore the building has potential on one component of the thermal envelope (walls, roof, and windows). Buildings with full renovation can be subjected to partial renovation only. LE_Renovation: the building was subjected to major renovation works in the past, all building constructions had been renovated and is thus considered as a building with low energy (LE) demand for space heating. Buildings with LE renovation are not considered as a potential for renovation. One of these states was determined for each representative of building typology of the build-ing stock. Renovation rates in the model do not apply for rates of one building component only, e.g. 3 % of walls renovation, but apply to the extent of possible renovation (partial, full, low energy). Partial renovation in the model covers renovation works on building’s envelope only, while full and LE renovation can include the replacement of a heat, DHW supply sys-tem, as well as installation of a mechanical ventilation system. All buildings cannot be renovated in one year only so the model is taking into account several limitations when renovating the building stock. Key results are shown are presented in the picture bellow. All the observed scenarios show great promise in the fulfilling the regional contribution to national goals for the reduction of final energy use and GHG emissions. 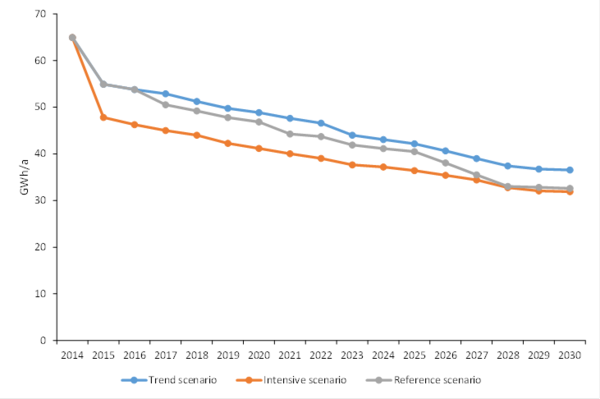 According to policy targets and EPISCOPE benchmark levels, shown are met in both the observed years – 2020 and 2030. In the base case of 2015 the estimated total final energy of the residential building stock in Slovenia is 10,789 GWh/year with an emission factor of 0.180 kg CO2/kWh. This gives a specific total average heat demand of 122.81 kWh/m2/year and a specific emission level of 22.2 kg CO2/m2/year. Trend scenario, reference and intensive scenarios give substantial reductions in annual total heat demand and CO2 emissions compared to 2015. The total average heat demand decreases from 122.81 kWh/m2/year to a level 103.1 – 117.7 kWh/m2/year in 2020, 82.3 – 110.4 kWh/m2/year in 2030 (depending on the scenario). With the given changes in the energy mix, the overall CO2 emission factor decreases from 0.180 to 0.167 kg CO2/kWh in trend scenario by 2020, although considerable improvements are recorded in annual CO2 emissions. The later are reduced from 22.2 kg CO2/m2/year in 2015 to 11.5 – 19.7 kg CO2/m2/year in 2020, 8.5 – 15 kg CO2/m2/year in 2030. Despite the significant growth in building stock reference area by 11.2 % from 2015 to 2030, these emission intensity improvements yield significant overall emission reductions (tons CO2/year) of 11 – 48 % in 2020 and 33 – 62 % reductions in 2030, compared to the 2015 lev-el, where buildings emit 1,581 kt of CO2 emissions. Policy target for the reduction of GHG emissions in buildings by 2030 at least 70 % compared to 2005 is achieved. Picture here shows the reduction of GHG emissions for all reference scenarios. Emissions of existing buildings in 2015 amounted to 1,208 kt CO2. The later by 2020 reduce to 971 kt CO2, by 2030 to 657 kt CO2. Emissions are reduced in 2020 to 58 % in 2030 and 72 % lower compared to base year 2005. Total emissions of existing and new buildings are slightly higher, and in 2030 estimated at 675 kt, which represents 71 % decrease compared on emissions in 2005. The trend from 2005 to 2013 is the result of past action and shows the actual recorded emissions. Such a large rise and then again a drop is mainly due to the use and then replacement of oil as energy carrier on account of increased use of biomass, due to its large potential. 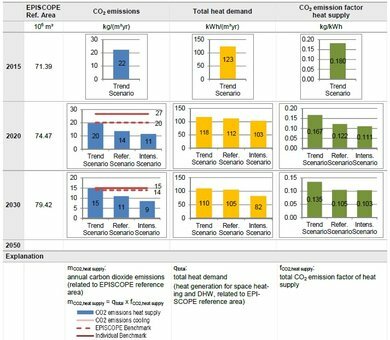 The red line on the Figure presents the expected results from reference scenario, where the share of RES technologies is going to increase, replacing the CO2 wasteful technologies. Figure below shows the reduction of primary energy for all scenarios in municipality Kocevje, one of the focal points is the impact of the local energy polidy implementation in practice (scenario C), where the expansion of local district grid is considered in 2016, 2020 and 2025. The primary energy is reduced for 14 %, 33 % and 44 %, respectively. The overall findings of the scenario analyses indicate that, in addition to the positive effect of high energy standards of new buildings to be constructed in the future, renovation activities in the existing building stock will effectively contribute to large and highly needed overall reductions in future energy use and CO2 emissions. There is a difference between the three scenarios, especially the intensive one. Intensive scenario predicts higher renovation rates and savings that are going to be hard to achieve. Hence, it will be important to develop policy instruments that facilitate the implementation of ambitious renovation measures, i.e. expansion of the local grid, renovation rates of at least 1.75 % in the single-family house sector and above 2.00 % in multi-family houses. Targeting subsidies to the full renovation. Continuation of the policy of promoting investment financial incentives (incentives Eco Fund). In the future, these incentives are more targeted, with the amount of incentives the comprehensive – full renovations of buildings will be stimulated more (maximum rate of co-financing will be part of the action comprehensive energy refurbishment of buildings, and the lowest execution of individual action). Subsidies should be linked also to check on the quality of realization of renovation. Renovation of neighborhoods: the issue has to be addressed and examined, in order to find the instruments to promote the rehabilitation of the neighborhoods. Increasing information campaigns not only for the energy efficiency in buildings and build-ing compliances but also users’ behavior. Additionally a movement to lower carbon society on a national scale will be needed to reduce the current electricity carbon factor. Further analysis, on either local or national level, can be carried out through visual presentation of analysis results, to further identify the best candidates in the national stock for refurbishment, which would help to inform the details of policies moving forward to help meet the carbon dioxide reductions required. Geographic Information Systems (GIS) offers the opportunity to characterize building stocks in some systematic dimensions using geo-referenced information for buildings. The main objective of this is to present building stock’s profile (e.g. consumption, potential and savings) through a GIS-based approach. To this goal, we developed an application with Google maps API, which enables a powerful way of presenting the energy balance of the building stock. An application was developed which shows several aspects of the building stock, resulting from the analyses. Web application located at www.energetskaizkaznica.si\map shows the potential for renovation of thermal envelope’s components. The buildings where roof, façade and windows are potential for renovation are marked as red with radius 3. Buildings with 2 components for renovation have radius 2, and buildings with potential for renovation of 1 component – radius 1. Imaging reveals that the vast majority of the buildings have a big potential for renovation on thermal envelope.